QAPCO is strongly committed to the continued growth and development of Qatar as it works towards realizing the ambitious goals of the Qatar National Vision 2030 (QNV 2030). Our wide-ranging social responsibility and engagement programs focus on three core themes: Education, Environment and Sport and Health. Each theme is underpinned by our commitment to the four pillars of the QNV 2030, and to developing Qatari Nationals and local capacities. Contributing to education, local skills and capacity creation in support of diversification and a knowledge-based economy, with a focus on Science, Technology, Engineering and Mathematics (STEM) disciplines and leadership development. Protecting and promoting Qatar’s natural environment, with a focus on protecting Qatar’s coastlines, educating the local community on the responsible use of plastics and recycling and waste management. 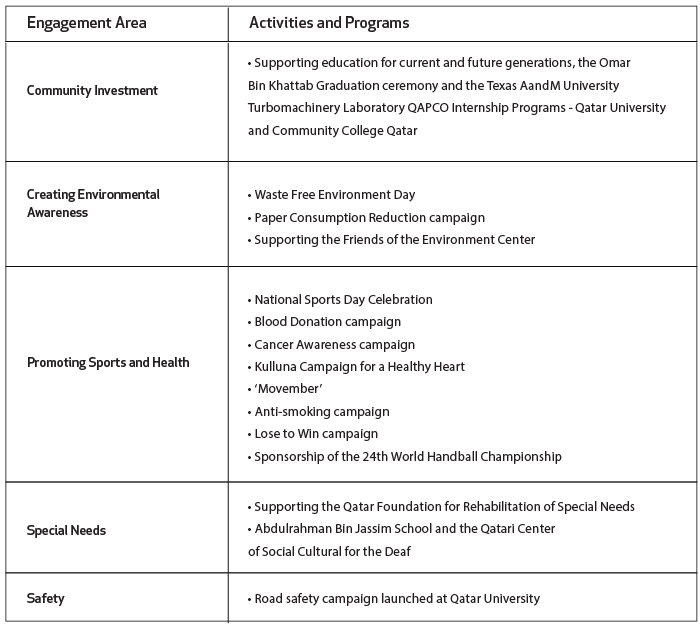 Focuses on helping Qatar address key public health challenges and encouraging healthy lifestyles. Proactively working with the right partners to maximise positive impacts and deliver sustainable solutions.